We’d love your help. Let us know what’s wrong with this preview of Battle Angel Alita, Volume 08 by Yukito Kishiro. 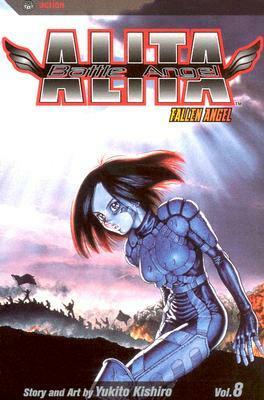 To ask other readers questions about Battle Angel Alita, Volume 08, please sign up. After two disappointing (but not too much) volumes, emotions and thrills abound in another top-score one with Alita battling against herself and the return of lots of the best characters in the saga (some just for a lone but intense image). And the long waited meeting of the Battle Angel with her father figure Ido is not going to be the one you was expecting for. This review is for Volumes 1 to 9. I became interested in reading the manga after watching the Alita: Battle Angel movie because the premise showed heaps of promise. This is definitely an action-packed read although the illustration is not exactly my type of art. I wanted to like this but it feels like the work is not polished. The manga pacing and execution totally threw me off. I found it hard to become grounded in the narrative and I felt like my bunch of ‘whys’ were not answered satisfactorily. We hardly get a taste of the surface of the world and the characters, and some things don’t make much sense. I’m giving it a chance on the next volumes but I’m not that optimistic. Las cosas comienzan a alinearse para el final y comienza a hacerse evidente que no habrá muchas respuestas en esta serie. Este volumen está acompañado por el reencuentro tan esperado entre dos personajes. Debo de admitir que nunca pensé que el status de Gally cambiara tanto. Ha sido uno de los protagonistas de manga que más transformación ha tenido porque va a terminar en un lugar completamente distinto a dónde comenzó. Me agrada ver como algunas de las relaciones del personaje terminan mal, no e Las cosas comienzan a alinearse para el final y comienza a hacerse evidente que no habrá muchas respuestas en esta serie. Este volumen está acompañado por el reencuentro tan esperado entre dos personajes. Debo de admitir que nunca pensé que el status de Gally cambiara tanto. Ha sido uno de los protagonistas de manga que más transformación ha tenido porque va a terminar en un lugar completamente distinto a dónde comenzó. Me agrada ver como algunas de las relaciones del personaje terminan mal, no es algo tan común de ver y es muy bueno que pase porque en el mundo real las cosas no son eternas, eso lo podemos apreciar mucho en este volumen. De nuevo tratan de cambiar la relación que Gally tiene con Zalem y aunque ahora sí parece que las cosas se están acomodando para un final, me siguen sin quedar claros los motivos de Gally y no entiendo porque no tiene el deseo de incendiar todo a su alrededor. El enfrentamiento en este volumen es un poco spoiler, así que sólo diré que aunque fue bastante entretenido y con mucha tensión, ya me lo veía venir. Me gustó mucho que un capítulo estuviera narrado por un pseudo reportero del bando de Den Barjack. Este personaje parece un tipo de persona pero mientras narra su capítulo se vuelve más y más perturbador. This review has been hidden because it contains spoilers. To view it, click here. Well, in this issue Alita faces off against a robot double of herself, the A-2, which proves even more powerful than she is. The only reason she defeats it is because Lou blasts the Zalem computer that controls it. I love that Lou gets in a hit here. 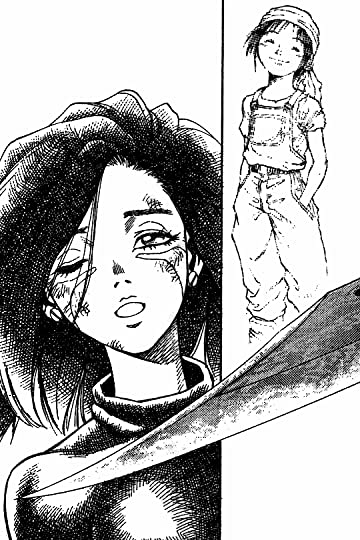 Alita finally finds Ido, who is now living with a robot girl who looks a lot like Alita and can do he Panzer whatever fighting art... so she is another pseudo clone of Alita. However, Ido can’t remember who Alita is because he erased his own memory a Well, in this issue Alita faces off against a robot double of herself, the A-2, which proves even more powerful than she is. The only reason she defeats it is because Lou blasts the Zalem computer that controls it. I love that Lou gets in a hit here. Alita finally finds Ido, who is now living with a robot girl who looks a lot like Alita and can do he Panzer whatever fighting art... so she is another pseudo clone of Alita. However, Ido can’t remember who Alita is because he erased his own memory after discovering a diabolical secret of Zalem. This is a great way to build up tension. Another Alita clone attacks and coordinates the destruction of the rebel’s led by Den. However, one robot dog manages to destroy this Alita clone. Right. This is a plot device I have seen so many times, wherein an enemy is introduced as incredibly powerful and an army is built of that enemy, but after the first is defeated, all the rest are weak as heck. Alita later gets trapped in a dream world, but is able to escape just because at the last minute via another uninspiring unexplained plot development. Esta es otra parte de la historia de la que recordaba escenas con claridad, y tiene muchas revelaciones y momentos interesantes. El arte continúa siendo excelente, y los personajes son increíbles. Siempre recuerdo lo impactante que me resulto Den la primera vez que leí esto, lo terrorífico que me resultaba Desty Nova... En ese momento no sabía lo cerca que estaba del final, apenas unos capítulos y se termina. Barjack attacks Zalem, Alita battles her twin and her greatest opponent in a dream/simulation. It's never clear what's at stake. My favorite character is the reporter that is also a serial killer. Never saw that coming. Pues, en comparación a los otros tomos, no me ha gustado demasiado. Siento que se ha exagerado la exageración (?). Alright, many things happened. Not the best. Let's finish this off with a big bang! Volume 09!!! Another great volume. The story, art, and character development are top-notch. Excellent series. Cool to see the old pals.That photographer was “a bit disturbed”. finally some revelations! now the story gets interesting. This book is bad.It is part comic part capter book. This is a future book . Like robots fighting till death, but it is boring.